Tops are permanently attached with hinges. Ergonomic designed handles for easy lifting. 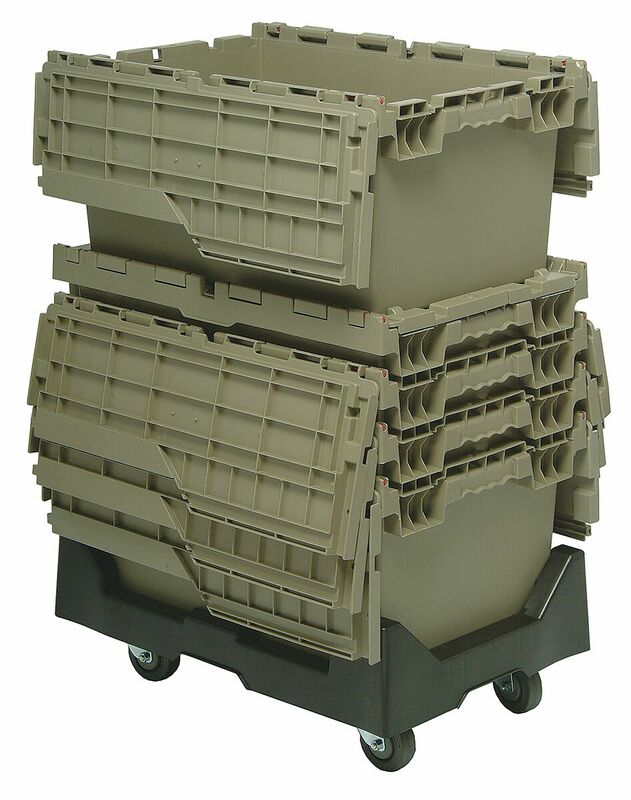 Stackable and reuseable, Ideal for storage, distribution and order picking. Textured , non-slip bottoms ensure smooth conveying. 20 x 11-1/2 x 7-1/2" Strong, reliable, and reusable totes are ideal for storage, distribution and order picking. Tops are permanently attached with hinges that interlock for stacking strength and security. Stack for maximized storage and nest when empty. Textured, non slip bottom ensures smooth conveying. Ergonomically designed allow for easy lifting. Recessed lids ensure maximum load stability. Padlock eye provides security option allowing lids to be fastened and/or locked. Molded from high density, FDA approved polyethylene. Lids close securely to protect parts from dust or damage. 20 x 11-1/2 x 7-1/2"
21-1/2x15-1/4x12-3/4" Strong, reliable, and reusable totes are ideal for storage, distribution and order picking. 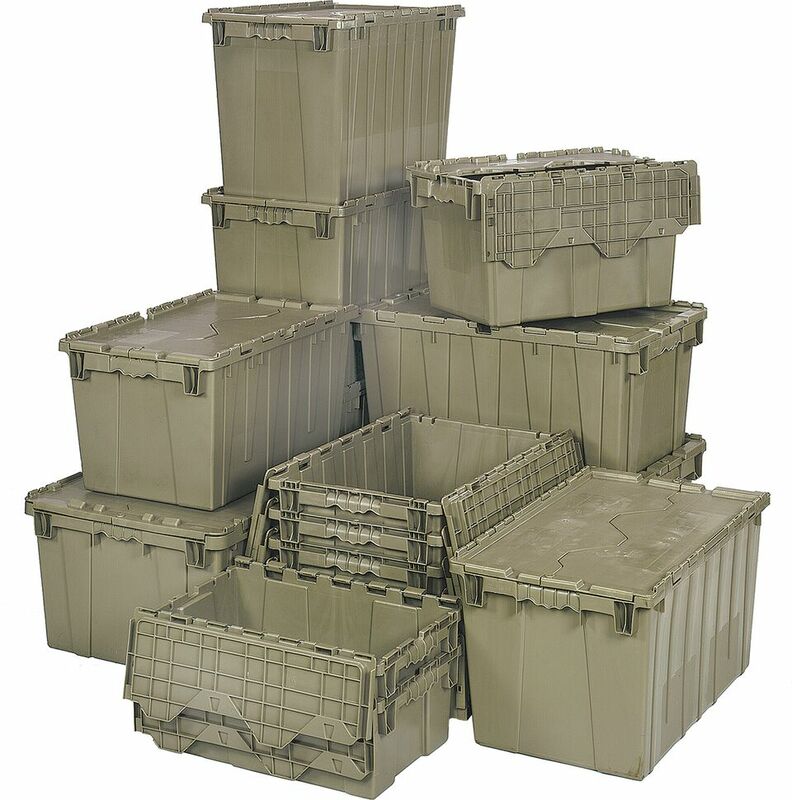 21-1/2 x 15-1/4 x 12-3/4"
21-1/2x15-1/4x17-1/4 " Strong, reliable, and reusable totes are ideal for storage, distribution and order picking. 21-1/2 x 15-1/4 x 17-1/4"
21-1/2x15-1/4x9-5/8" Strong, reliable, and reusable totes are ideal for storage, distribution and order picking. 21-1/2 x 15-1/4 x 9-5/8"
22-1/8x12-13/16x11-7/8" Strong, reliable, and reusable totes are ideal for storage, distribution and order picking. 22-1/8 x 12-13/16 x 11-7/8"
24x20x12-1/2" Strong, reliable, and reusable totes are ideal for storage, distribution and order picking. 24 x 20 x 12-1/2"
24x15x13-3/4" Strong, reliable, and reusable totes are ideal for storage, distribution and order picking. 24 x 15 x 13-3/4"
27x17-3/4x12-1/2 " Strong, reliable, and reusable totes are ideal for storage, distribution and order picking. 27 x 17-3/4 x 12-1/2"
28x20-5/8x15-5/8" Strong, reliable, and reusable totes are ideal for storage, distribution and order picking. 28 x 20-5/8 x 15-5/8"
Attached top distributor container optional clear label holder is ideal for easy identification of stored items. Label holder includes insert, enables orderly storage of items and is efficiently used in inventory control. 3 x 5 x 1-1/2"